There’s nothing like a warm cup of coffee and some brilliant home decor! This fall has been filled with some festive and trendy decor pieces, like our Rustic Painted Pine Cones and Acorns. To rein in some of the warmth we feel during these cooler days I wanted to create some warm, sparkling decor that follows this years style. After some research into popular decor trends for 2018 I was able to come up with these beautifully warm Painted Glam Fall Pumpkin Home Decor keep reading to find out how you can make some too! The main element for this project are the colours and accessories. This year many decor pumpkins aren’t their natural orange! The colours for my pumpkins are based on trending styles for 2018, so bronze and rose, which look sooo nice together! Then I went to the store to get some accessories. I LOVE sparkle so I chose some glittery ribbon, tule and fall foliage. I also added a metal element as this is also a trendy way to celebrate Fall this year. Once the pumpkins were painted, dried and accessorized, the arrangement was easy. Just place one of the pumpkins a little higher then the other and spread some foliage around the bottom. This centre piece is sure to grab some attention for this year’s Thanksgiving dinner. And even if you’re going out for dinner, seeing this arrangement with your morning coffee will give you the morning pick me up you need! With that said, let’s take a look at how to make these beautiful, glittery DIY painted pumpkins. 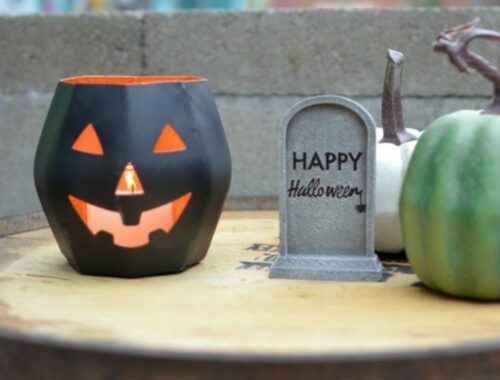 You’ll want to spray your pumpkins first. Bring them inside and allow them to dry and get to room temperature, this will help the spray paint adhere. You will need to bring them back outside or into a well ventilated room to spray. Apply one coat at a time, allowing it to dry between each coat. Follow the instructions on the side of the can. Once the pumpkins are completely coated and dry you can add the ribbon. I started with the sparkly ribbon on the bottom of the rose pumpkin. I also cut the ribbon in a fun design to add a little something. Using the hot glue gun, stick the ribbon to the pumpkin. Be careful not to pull on the ribbon once it’s been glued as this can pull off the paint. Apply some ribbon to the top of the pumpkin as well. Add some accessories to the top of the pumpkins so it really shows. This year we are seeing a lot of mixed media in projects and this should be no exception! A perfect addition to your fall decor this year. Almost done these beautiful DIY Painted Pumpkins! The arrangement. Once the pumpkins are finished, place them in the middle of your dinner table, front entrance way or mantel with the foliage along the bottom. Play around with the pieces until if fits the space! There you have it! 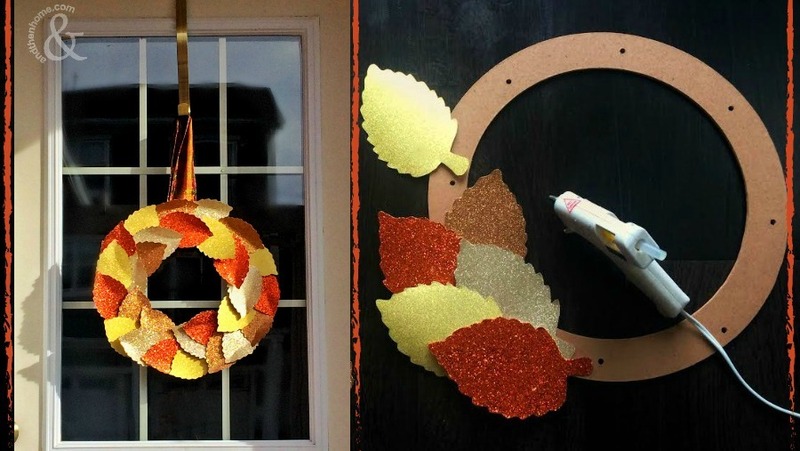 This warm and trendy fall home decor project is fun to make and looks stunning when finished. What colours will you be using in your fall decor this year? Be sure to let us know in the comments section! Looking for more fall decor? Check out our Stamped Thanksgiving Napkin Rings or if your ready to move onto Halloween, check out this DIY Black Light Halloween Wreath. Here’s some more fall decor to get you ready this year!